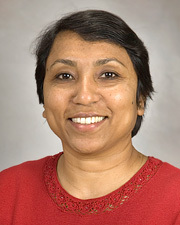 Dr. Nahid Rianon is an Assistant Professor of the Division of Geriatric Medicine at McGovern Medical School at The University of Texas Health Science Center at Houston (UTHealth). She sees patients in the Acute Care for the Elderly (ACE) unit at the Memorial Hermann Hospital and at the Center for Healthy Aging (CHA) in Bellaire, TX. She runs the Geriatric Osteoporosis clinic at the CHA and her main research interest is osteoporosis due to age-related bone loss and fracture prevention. Dr. Rianon serves as a mentor faculty for Global Health scholarly concentration and conducts international research on geriatric health topics in South Asia. Young investigator award from the ASBMR, New Faculty Scholar from STFM, Hartford Scholar and T. Franklin Williams Scholar are a few of the many awards she received for her scholarly achievements. She received multiple research grants including funding from NASA and the NIH. Her current research investigates the role of antihypertensive medication in the prevention of bone loss.